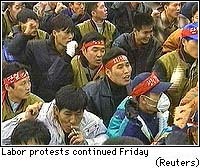 SEOUL, South Korea (CNN) -- South Korea's largest organized strike ever spread from factories and shipyards to key services in Friday as hospital workers joined protests against a new law limiting labor power. "If the strikes are extended into the new year, that will basically mean an indefinite strike," said Korea Federation chairman Park In-sang. He said the union will decide Monday whether to take that action. Outpatient services at 14 hospitals were closed, and more hospitals were expected to be affected Saturday. The country's largest car-making factories remained idle for a second day. Seoul's subway workers vowed to go on strike beginning Saturday. More than 4 million passengers a day rely on the capital's primary subway lines. Seoul bus drivers postponed a strike planned for Saturday because of logistics troubles, but bus operations in five other major cities were threatened. In addition, the more militant and outlawed Korea Confederation of Trade Unions instructed its 500,000 members to strike. Membership in all unions accounts for less than 20 percent of the workforce but commands key export industries. Strikes began Thursday after ruling party legislators passed the new law at dawn without opposition members present. The new law makes it easier for companies to lay off employees, and it bans multiple unions at any work site until 2002. Finance Minister Han Seung-soo contends the new law protects jobs in the long term by making South Korea's economy more competitive. The law also allows companies to replace strikers. Bundled in thick blankets in the cold, opposition deputies continued their occupation of the National Assembly in protest of the government's tactics. They vowed to stay until Sunday. The South Korean stock market plunged to its lowest level in three years Friday, closing 7.79 points lower to close at 651.22, as investors worried the strike would hurt the country's export-led economy. Reporter Lim Yon-Suk and Reuters contributed to this report.